Kolahoi Base Camp (4140m) is a seven day trekking expedition in Kashmir. The trail for trekking to Kolahoi Base Camp is relatively easy and cuts through lush meadows of Aru Valley in Pahalgam, rich forest of Lidderwat (3050m) and Satlenjan (3420m) and the highland lake Tarsar. 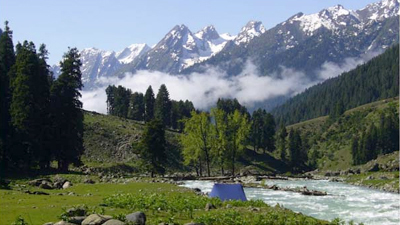 This trek in Kashmir is popular since 1900s and has been aimed by many veteran trekkers around the globe. Srinagar sets the starting point of the trek; however Aru Valley is where the trekking actually starts from. An 11kms trekking from Aru to Lidderwat concludes the third day of the trek. The fourth day begins with an early head out to Satlenjan, where trekkers get an opportunity to acclimatize for the further lead on trekking towards the Kolahoi Base Camp. Gujars encampments and lush greed pasture along the Lidder River welcomes trekkers at Satlanjan. An exhausting upward trail and rough terrain along with nomadic shepherds beckons the proximity to Kolahoi Base Camp. To get the best view of the Kolahoi Peak, trekkers can climb the ridge, which lies opposite to the peak. On arrival you will be met at the airport (or the Tourist Reception Centre if you travelled overland) and transferred to the houseboat/hotel for your overnight stay. There will be an afternoon Shikara ride on Dal Lake. Day 2 : Srinagar - Aru via Pahalgam (2420m). 4 hours approx. An early morning start is imperative as it is a long drive of 105 km to Aru, a beautiful lush green pasture with the grand Katrinag Mountains as a backdrop. Afternoon at leisure, or a few short walks to stretch the legs for the days ahead. Overnight in tents on a twin share basis. Lidder River, crossing the odd side stream. As we near camp the valley narrows; a foot bridge leading us to our campsite. A short and easy day today to help with acclimatization, we trek along the true right of the gushing waters of the Lidder River on an undulating, occasionally steep, trail. We cross five tributaries of a side river beside the Gujars encampment and continue with a gentle descent towards a lush green meadow beside the Lidder River for our overnight camp. There is an optional acclimatization side walk to a ride in the afternoon. An early morning start is imperative as we have a long day ahead of us. Our hike begins upwards and onwards as we head towards Kolahoi Base Camp, passing nomadic shepherds en-route. As we get closer to the glacier the walk becomes a little harder as the terrain becomes rough glacial moraine, but the increasingly spectacular views of the Kolahoi Peak urge us on. In order to gain the best view of Kolahoi we may have to climb a little higher on the ridge opposite. The return walk is easier and quicker as we head back to Lidderwat via Satlanjan, elated from being so close to the majestic peak. After a leisurely breakfast we retrace our steps down to Aru and board our chartered bus/car to drive to Srinagar for an overnight stay at houseboat. 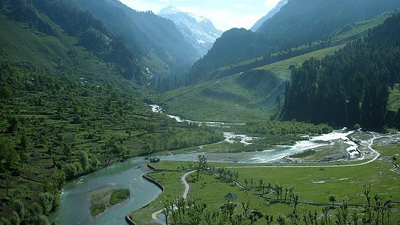 You will be transferred to Srinagar airport or the Tourist Reception Center for overland.